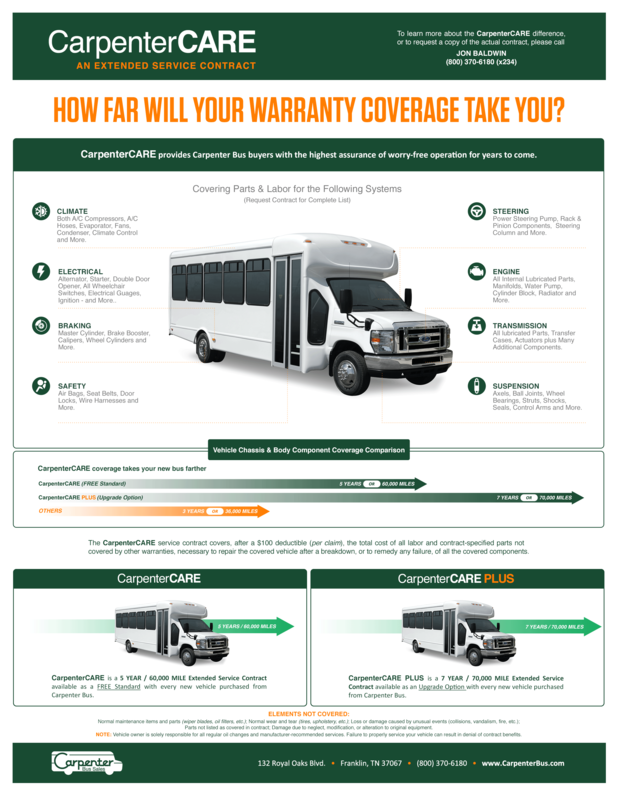 Any new bus that you purchase from Carpenter Bus Sales will have a chassis warranty from the chassis manufacturer (Ford, for instance) and warranties on various components of the body. But Carpenter Bus Sales has gone the extra mile in providing additional Body & Chassis coverage for your new bus. With CarpenterCare, your coverage is extended to 5 Years instead of 3, and 60,000 miles instead of 36,000. And, best of all, that extra coverage is free! No other bus dealer offers anything like it. Your local chassis dealer will take care of the chassis warranty. For body warranty claims, we will help you find a qualified service center in your local area to do the repairs. 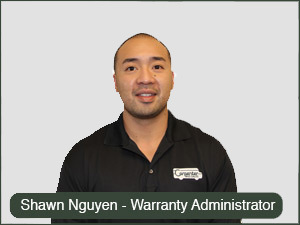 Whenever you have a warranty claim, just call our warranty clerk who will be glad to assist you. He will help you get the approval for your repairs, and then get you reimbursed or pay the service center directly. Our relationship with you doesn’t end with your purchase of a bus. We’re with you for the long haul. Basic CarpenterCare covers, after a $100 deductible (per claim), the total cost of all labor and contract-specific parts not covered by other warranties, necessary to repair the covered vehicle after a breakdown, or to remedy any failure, of all the covered components for 5 Years or 60,000 Miles. CarpenterCare Plus is an upgrade option extends the same coverage to 7 Years or 70,000 Miles. Click here to learn about the CarpenterCare Warranty difference!